Oil canning is a natural phenomenon that appears as lines or waviness in the flat areas of a metal roofing or wall panel. Elastic buckling and stress wrinkling are other terms used to describe this occurrence. Oil canning can occur in any type of metal and is caused by a number of factors. There is no effective way to measure oil canning; it is an aesthetic concern and typically has no impact on the performance of the panel. Oil canning is often only visible at certain angles and under certain lighting conditions. Typically panels with larger flat areas and with glossier colors are more susceptible to oil canning. Metal coil is produced by rolling metal under pressure. Any deviations in the centering or camber of the coil can introduce differential stresses. The roll forming processes can also introduce internal stresses. 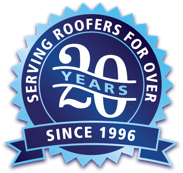 Misalignment of the roof deck (any contoured or non-flat areas), movement of the structure (racking, drift, settlement, etc), roof camber, and other irregularities in the roof substrate will introduce stress into the panels. Over driving fasteners and handling on the job site that allows twisting, buckling, or bending will produce internal stress in the panels. Expansion and contraction will primarily take place in the longitudinal direction (long-ways). The difference in movement in the long direction versus the short direction will introduce stress in the panel. Additionally, any constraint (i.e. screws/penetrations) that restrains the thermal expansion/contraction will introduce significant stress in the panel. A 30’ steel panel that sees a 100°F change in temperature might change length by ¼”, which does not seem like much. However, if that expansion is held back, it can result in almost 20,000 psi of pressure. How can Oil Canning be Avoided? Oil canning is a naturally occurring condition, and it is not possible to completely eliminate the risk. The standard phrase in the industry is “oil canning is not a defect and is not a cause for rejection.” The following items can help to reduce the risk; however, it is important to communicate expectations with the end user before potential issues arise. Typically, a thicker gauge material will have less risk of oil canning. Gulf Coast recommends striations to minimize both the risk of oil canning and also the visibility of oil canning if and when it does occur. Striations break up the large flat areas of the panel and add a measure of rigidity to the panel. Taping a thin backer rod to the back center of a panel causes the panel to bulge up slightly along the centerline of the panel, helping to relieve internal stresses. Overtightening fasteners or other installation/handling issues on the job site are the most common preventable causes of oil canning. Careful handling and using care to not overdrive fasteners can reduce the risk of oil canning. 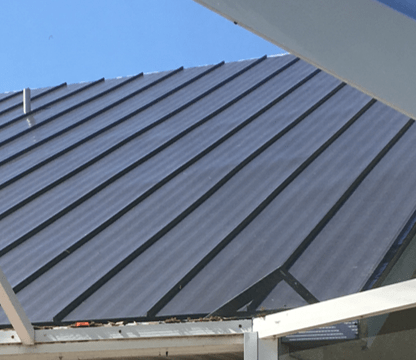 Most standing seam panels have fastening options that allow some movement of the panel (e.g. floating clips or nail slots). When properly installed, these systems are able to physically expand and contract during the heat-cool cycle of the day. 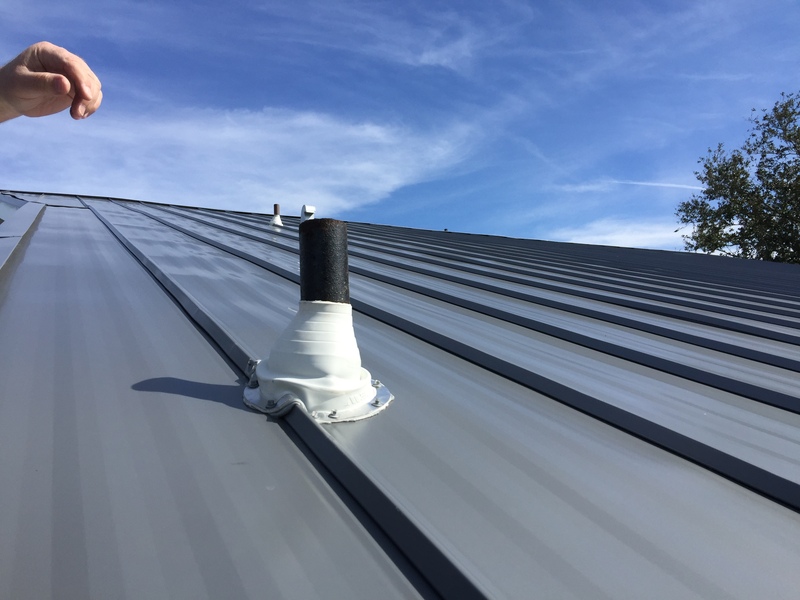 Use care when detailing these systems—if a typical Z-flashing system is used for the ridge cap, this will pin the top of the panel. Furthermore, any penetrations or other items that “pin” the metal will restrict this movement. Despite all best practices being implemented, oil canning may still occur in some cases. If the causes are in the deck or substrate, replacing panels will likely not solve the oil canning issue. Because oil canning is an aesthetic issue that typically does not impact performance, and in the absence of any specific contract requirement, oil canning alone should not be grounds for rejection of a product or installation. This page is based largely on a Metal Construction Association Technical Bulletin, as well as our own experience over 20 years. For more information, the MCA oil canning bulletin can be accessed here, or contact your Gulf Coast sales team.